With our diabetes-management-software-SiDiary you can easily import data from your Bionime GM550 blood glucose meter and use lots of advantages of statistical analysis, trend analysis and graphics to improve your therapy together with your doctor. For the data import from Bionime GM550, the original manufacturer data cable is required. 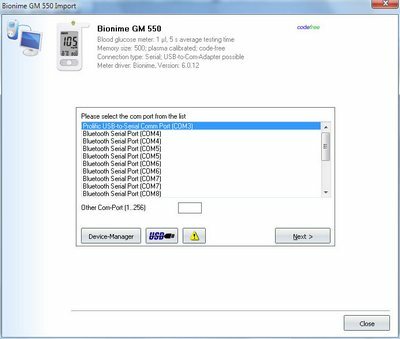 You’ll need a USB-Port on your computer and the Bionime USB-Cable driver. Here you'll find more details directly from the manufacturer Bionime.